Stats = validatemodel(sc) validates the quality of the creditscorecard model. By default, the data used to build the creditscorecard object is used. You can also supply input data to which the validation is applied. Stats = validatemodel(sc,data) validates the quality of the creditscorecard model for a given data set specified using the optional argument data. [Stats,T] = validatemodel(sc,Name,Value) validates the quality of the creditscorecard model using the optional name-value pair arguments, and returns Stats and T outputs. [Stats,T,hf] = validatemodel(sc,Name,Value) validates the quality of the creditscorecard model using the optional name-value pair arguments, and returns the figure handle hf to the CAP, ROC, and KS plots. Perform automatic binning using the default options. By default, autobinning uses the Monotone algorithm. 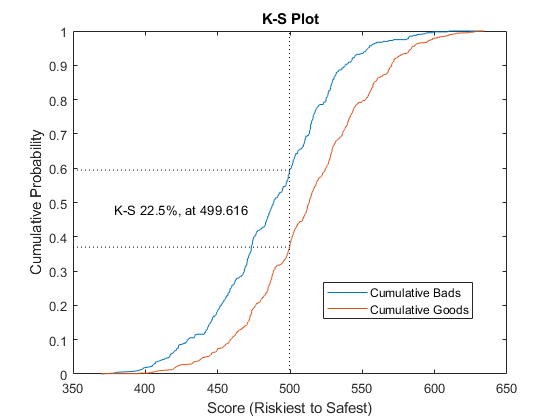 Validate the credit scorecard model by generating the CAP, ROC, and KS plots. 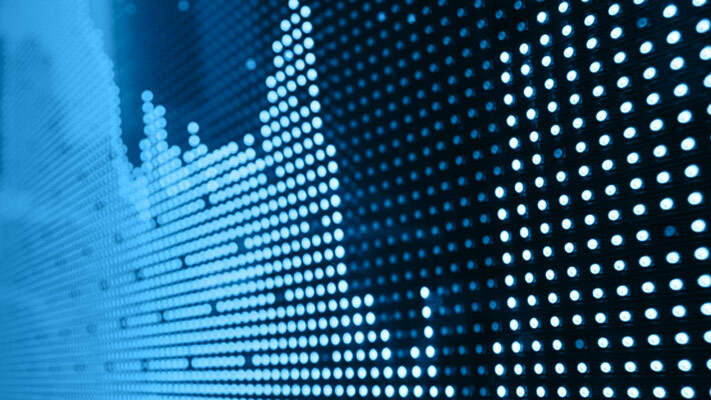 Use the CreditCardData.mat file to load the data (dataWeights) that contains a column (RowWeights) for the weights (using a dataset from Refaat 2011). Create a creditscorecard object using the optional name-value pair argument for 'WeightsVar'. Validate the credit scorecard model by generating the CAP, ROC, and KS plots. When the optional name-value pair argument 'WeightsVar' is used to specify observation (sample) weights, the T table uses statistics, sums, and cumulative sums that are weighted counts. This example describes both the assignment of points for missing data when the 'BinMissingData' option is set to true, and the corresponding computation of model validation statistics. Predictors that have missing data in the training set have an explicit bin for <missing> with corresponding points in the final scorecard. These points are computed from the Weight-of-Evidence (WOE) value for the <missing> bin and the logistic model coefficients. For scoring purposes, these points are assigned to missing values and to out-of-range values, and the final score is used to compute model validation statistics with validatemodel. Predictors with no missing data in the training set have no <missing> bin, therefore no WOE can be estimated from the training data. By default, the points for missing and out-of-range values are set to NaN, and this leads to a score of NaN when running score. For predictors that have no explicit <missing> bin, use the name-value argument 'Missing' in formatpoints to indicate how missing data should be treated for scoring purposes. The final score is used to compute model validation statistics with validatemodel. Set a minimum value of zero for CustAge and CustIncome. With this, any negative age or income information becomes invalid or "out-of-range". For scoring and probability of default computations, out-of-range values are given the same points as missing values. For EmpStatus and CustIncome there is no explicit bin for missing values, because the training data has no missing values for these predictors. For predictors that have no missing data in the training set, there is no explicit <missing> bin. By default the points are set to NaN for missing data, and they lead to a score of NaN when running score. For predictors that have no explicit <missing> bin, use the name-value argument 'Missing' in formatpoints to indicate how missing data should be treated for scoring purposes. For the purpose of illustration, take a few rows from the original data as test data and introduce some missing data. Also introduce some invalid, or out-of-range, values. For numeric data, values below the minimum (or above the maximum) allowed are considered invalid, such as a negative value for age (recall 'MinValue' was earlier set to 0 for CustAge and CustIncome). For categorical data, invalid values are categories not explicitly included in the scorecard, for example, a residential status not previously mapped to scorecard categories, such as "House", or a meaningless string such as "abc123". This is a very small validation data set, only used to illustrate the scoring of rows with missing and out-of-range values, and its relationship with model validation. The validation results are unreliable, the scores with NaN values are kept (see the validation table ValTable below), but it is unclear what impact these NaN values have in the validation statistics (ValStats). This is a very small validation data set, but NaN scores could still influence the validation results on a larger data set. Use the name-value argument 'Missing' in formatpoints to choose how to assign points to missing values for predictors that do not have an explicit <missing> bin. In this example, use the 'MinPoints' option for the 'Missing' argument. The minimum points for EmpStatus in the scorecard displayed above are 58.8072 and for CustIncome the minimum points are 29.3753. The validation results are no longer influenced by NaN values, since all rows now have a score. Credit scorecard model, specified as a creditscorecard object. To create this object, use creditscorecard. In addition, the table must contain a binary response variable. When observation weights are defined using the optional WeightsVar name-value pair argument when creating a creditscorecard object, the weights stored in the WeightsVar column are used when validating the model on the training data. If a different validation data set is provided using the optional data input, observation weights for the validation data must be included in a column whose name matches WeightsVar, otherwise unit weights are used for the validation data. For more information, see Using validatemodel with Weights. 'Scores' — Returns the statistics (Stats) at the observation level. Scores are sorted from riskiest to safest, and duplicates are removed. 'Deciles' — Returns the statistics (Stats) at decile level. Scores are sorted from riskiest to safest and binned with their corresponding statistics into 10 deciles (10%, 20%, ..., 100%). 'None' — No plot is displayed. 'CAP' — Cumulative Accuracy Profile. Plots the fraction of borrowers up to score “s” versus the fraction of defaulters up to score “s” ('PctObs' versus 'Sensitivity' columns of T optional output argument). 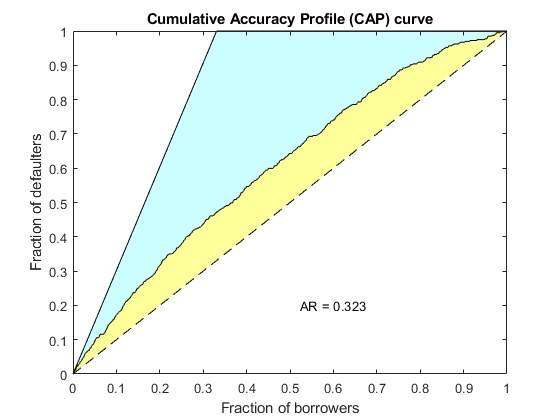 For more details, see Cumulative Accuracy Profile (CAP). 'ROC' — Receiver Operating Characteristic. Plots the fraction of non-defaulters up to score “s” versus the fraction of defaulters up to score “s” ('FalseAlarm' versus 'Sensitivity' columns of T optional output argument). For more details, see Receiver Operating Characteristic (ROC). 'KS' — Kolmogorov-Smirnov. Plots each score “s” versus the fraction of defaulters up to score “s,” and also versus the fraction of non-defaulters up to score “s” ('Scores' versus both 'Sensitivity' and 'FalseAlarm' columns of the optional output argument T). For more details, see Kolmogorov-Smirnov statistic (KS). For the Kolmogorov-Smirnov statistic option, you can enter 'KS' or 'K-S'. The second column, 'Value', contains the values corresponding to these measures. Validation statistics data, returned as an N-by-9 table of validation statistics data, sorted, by score, from riskiest to safest. When AnalysisLevel is set to 'Deciles', N is equal to 10. Otherwise, N is equal to the total number of unique scores, that is, scores without duplicates. 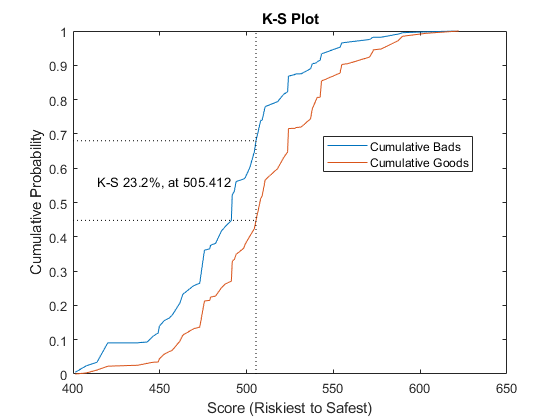 'Scores' — Scores sorted from riskiest to safest. The data in this row corresponds to all observations up to, and including the score in this row. 'ProbDefault' — Probability of default for observations in this row. For deciles, the average probability of default for all observations in the given decile is reported. 'TrueBads' — Cumulative number of “bads” up to, and including, the corresponding score. 'FalseBads' — Cumulative number of “goods” up to, and including, the corresponding score. 'TrueGoods' — Cumulative number of “goods” above the corresponding score. 'FalseGoods' — Cumulative number of “bads” above the corresponding score. 'Sensitivity' — Fraction of defaulters (or the cumulative number of “bads” divided by total number of “bads”). This is the distribution of “bads” up to and including the corresponding score. 'FalseAlarm' — Fraction of non-defaulters (or the cumulative number of “goods” divided by total number of “goods”). This is the distribution of “goods” up to and including the corresponding score. 'PctObs' — Fraction of borrowers, or the cumulative number of observations, divided by total number of observations up to and including the corresponding score. When creating the creditscorecard object with creditscorecard, if the optional name-value pair argument WeightsVar was used to specify observation (sample) weights, then the T table uses statistics, sums, and cumulative sums that are weighted counts. Figure handle to plotted measures, returned as a figure handle or array of handles. When Plot is set to 'None', hf is an empty array. CAP is generally a concave curve and is also known as the Gini curve, Power curve, or Lorenz curve. where AR is the area between the CAP curve and the diagonal, and AP is the area between the perfect model and the diagonal. This represents a “random” model, where scores are assigned randomly and therefore the proportion of defaulters and non-defaulters is independent of the score. The perfect model is the model for which all defaulters are assigned the lowest scores, and therefore, perfectly discriminates between defaulters and nondefaulters. Thus, the closer to unity AR is, the better the scoring model. 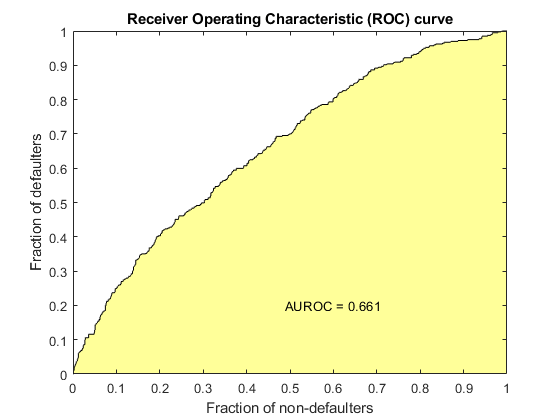 To find the receiver operating characteristic (ROC) curve, the proportion of defaulters up to a given score “s,” or “Sensitivity,” is computed. This proportion is known as the true positive rate (TPR). Additionally, the proportion of nondefaulters up to score “s,“ or “False Alarm Rate,” is also computed. This proportion is also known as the false positive rate (FPR). The ROC curve is the plot of the “Sensitivity” vs. the “False Alarm Rate.” Computing the ROC curve is similar to computing the equivalent of a confusion matrix at each score level. The Kolmogorov-Smirnov (KS) plot, also known as the fish-eye graph, is a common statistic used to measure the predictive power of scorecards. The KS plot shows the distribution of defaulters and the distribution of non-defaulters on the same plot. For the distribution of defaulters, each score “s” is plotted versus the proportion of defaulters up to “s," or “Sensitivity." For the distribution of non-defaulters, each score “s” is plotted versus the proportion of non-defaulters up to “s," or “False Alarm." The statistic of interest is called the KS statistic and is the maximum difference between these two distributions (“Sensitivity” minus “False Alarm”). The score at which this maximum is attained is also of interest. Model validation statistics incorporate observation weights when these are provided by the user. Without weights, the validation statistics are based on how many good and bad observations fall below a particular score. On the other hand, when observation weights are provided, the weight (not the count) is accumulated for the good and the bad observations that fall below a particular score. When observation weights are defined using the optional WeightsVar name-value pair argument when creating a creditscorecard object, the weights stored in the WeightsVar column are used when validating the model on the training data. When a different validation data set is provided using the optional data input, observation weights for the validation data must be included in a column whose name matches WeightsVar, otherwise unit weights are used for the validation data set. Not only the validation statistics, but the credit scorecard scores themselves depend on the observation weights of the training data. For more information, see Using fitmodel with Weights and Credit Scorecard Modeling Using Observation Weights. “Basel Committee on Banking Supervision: Studies on the Validation of Internal Rating Systems.” Working Paper No. 14, February 2005. Loeffler, G. and Posch, P. N. Credit Risk Modeling Using Excel and VBA. Wiley Finance, 2007.